Momentus Golf Weighted Hip Turn Belt The Weighted Hip Turn Belt uniquely positions 5 lb. weights directly over the hips to create power, balance, and stability throughout the golf swing. Making practice swings with the Weighted Hip Turn Belt will give you the sense of engaging your hips early on in the golf swing to synchronize your lower body with your upper torso. You will be strengthening your core for more control and power to play your best golf. You can even hit balls while wearing the Weighted Hip Turn Belt. Follow the included exercise instructions for golf-specific training to see immediate improvement. Instructional DVD & Golf Fitness Workout Poster Included. 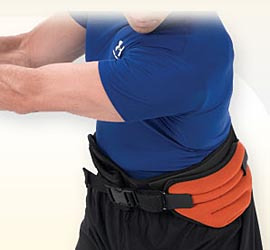 If you have any questions regarding the Momentus Golf Weighted Hip Turn Belt, please give us a call, we would be happy to help you with any questions you may have. Write an online review on the Momentus Golf Weighted Hip Turn Belt, and share your thoughts with others.